The PCE-HGP humidity detector is designed for the professional measuring of climactic conditions or for the evaluation of damage in the construction industry. The humidity detector measures relative humidity and ambient temperature as well as absolute humidity in construction materials and wood. Using the provided table, you can determine the dew point. With this humidity detector you acquire a multifunctional device which is highly accurate for measurements on site. Other advantages are its easy use as well as its small size and weight, it fits in your pocket perfectly. 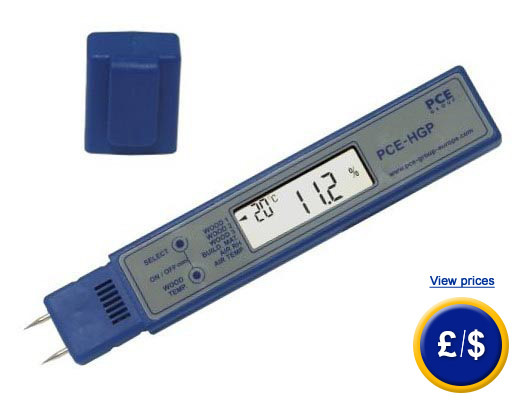 In order to use the PCE-HGP humidity detector, simply remove the protective front cover, connect the device, simultaneously press two left buttons of the display, select the measurement function and begin measuring. This link shows an overview of each humidity detector we have available to suit your needs. The humidity detector has penetrating pins to capture a reading of the absolute humidity in wood or construction materials as well as a combined sensor to measure relative humidity and temperature. The part of the device that measures absolute humidity is not subjected to variation with use and is reliable over an extended period. Of course, the accuracy of the relative humidity sensor will be affected over time and should be calibrated regularly. This can be done by the technicians at PCE Instruments or any other accredited laboratory. For measuring relative humidity, the humidity detector comes with a humidity sensor that works in a capacitive mode, based on the reversible absorption of vapour (using a polymer layer). The apparent constant dielectric of this layer, which is considered the capacity of the device, is in direct proportional equilibrium with the relative humidity of the surrounding atmosphere. The sensor is located under the vent at the back. 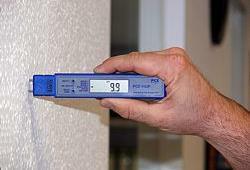 The image to the left shows a humidity detector measuring the humidity of a wall (absolute humidity in %/here the reading is 9.9%). The measurement is done via two measurement pins. The two pins are very small and once they are removed from the material, no real marks remain in the material surface that are identifiable. A measurement of absolute humidity in wood can be done with the penetrating pins as well. If measurements of very hard materials are required, it is recommended to put two nails into the material. Then the detector should be attached after they are in place. The LCD is 15 mm high and clearly shows readings. To the left of the display are buttons used for setting measurement parameters (Building Moisture for measuring construction materials, Wood Moisture for measuring wood and settings for measuring relative humidity and temperature). For companies that wish to incorporate the device into their internal quality control tools or for annual recalibrations. The ISO certificate includes a calibration and a document containing all the taken readings as well as the company details. The humidity detector comes with a series of pins placed on the end to penetrate the material. These pins may break and replacements are available in packs of ten. Unscrew the device and change the broken pin for a new one. Refasten the device and continue taking readings.